I can't believe this isn't here, but Chainer is a must-have for MPT. While i'm not currently using it, Tassel of Blue is using it in her EDM and swears by it. She has taught me a little about what it can do, and when i get back to tracking songs for Aeon, i will definitely be using it. I'm sure a link can be found at KVR, but for those who don't know, it's not free. 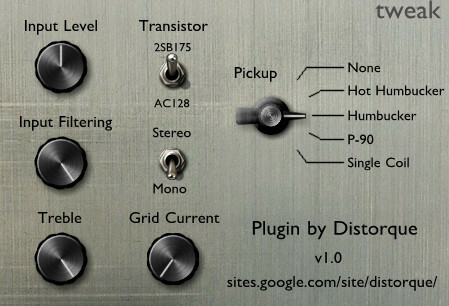 This VST does: Syncs flanging, filtering, and panning LFOs and envelopes to your host's clock. We were looking for a synchronized leslie for a pad when we went to post, and MDA's was impossible to work with. Kitchen sync allows you to set your leslie (or flanger) to ModPlug's clock. Link to VST or site: Found it at kvraudio.com. Nice little tool to add to your collection. We highly recommend it. *Gain controls the gain from input signals (0dB equals no maximization). *Release time of the gain reduction (mS). *OutCeiling controls the maximum output signal peak amplitude. *ISP (Inter Sample Peak) detection. *Comprehensive gate and expander audio treatments. *Easy routing and stereo imaging changes. Sir Elliot’s 1977 Preamplifier is aimed for those who master music that would like a rich tone with a touch of character. The 1977 Preamplifier performs superb on Jazz & Dance music that sounds too flat. This Preamplifier was designed on a 192 kHz platform to take full advantage of high sample rates ranging from 88.2 to 192 kHz however, will function fine on low sample rates such as 48 & 44.1 kHz. Platinumears sort un compresseur multibandes: 5ORCER. 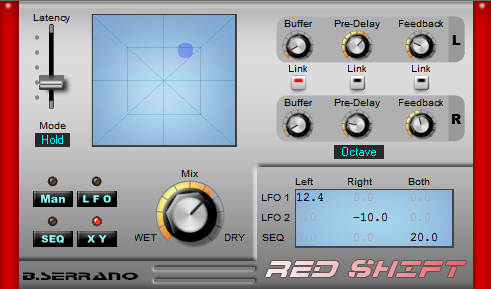 *Transparent and easy to use multi-band compression. *Dynamic EQ topology to reduce phase artifacts. *Five FL4TT3RY 2 compressors, with band-limited side-chains. *External side-chain inputs (switchable per band). *Intuitive “solo in place” function for each band. *Optional soft clipping keeps your peaks below 0dBFS. *Flexible Gain / Gain Reduction meters with switchable range. Do you still miss playing Nibbles in FT2? Well, now you can play Tetris in OpenMPT! Distorque a sorti Rangebastard, émulation de Dallas Rangemaster treble boost. The Rangemaster was a Germanium transistor treble boost developed in the 1960s. It and similar effects have been used by Eric Claption, Brian May, and many more great guitarists. It’s most often used to drive a distorted tube amp into more distortion, while boosting the upper-mids for a screaming lead sound. Ignite Amps a sorti The Anvil, émulation d' Andy Zeugs’ tube guitar preamp. The Anvil is a digital emulation of a three channels tube preamplifier for guitar. It has been developed to accurately model its real hardware counterpart, designed by Andy Zeugs. *Three channels: clean, rhythm and lead, each with fully separated controls. ToneBoosters a sorti TB EZQ. TB EZQ is a zero-latency, VST implementation of the work by Andrew Sabin and Bryan Pardo from the interactive audio lab at Northwestern University, IL, USA. They developed a method to automatically map common equalization manipulations involving multiple equalizer controls onto descriptive terms such as ‘warm’, ‘dark’ and ‘bright’. These descriptive labels can subsequently be placed onto a 2-dimensional space, in which each point represents a certain amount of ‘warmth’, ‘darkness’, and ‘brightness’. More information can be found in their paper. TB EZQ consists of a static implementation of their results with fixed descriptors. With this plugin, common equalization tasks to manipulate warmth or brightness can be performed much more efficient than with common equalizers involving many controls that require manipulation. *Support of all sampling rates from 44.1 to 192 kHz. *Simple and intuitive user interface. *Based on the VST 2.4 specification to allow compatibility with virtually all host programs. 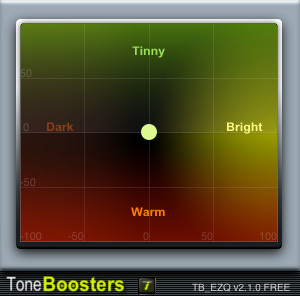 *TB EZQ is available to download as a freeware VST plug-in for Windows and Mac. B. Serrano a sorti RedShift 3. *2 pitching scales: Semi-tones or Octave. *1 graphical sequencer (16 steps). *New: Separate settings for Left / Right channels. *New: 1 XY pad controller for Left / Right channels.